Back in 2013 Salt House released their highly acclaimed debut album 'Lay Your Dark Low' which was a beautiful collection of traditional Scottish songs combined with the bands own contemporary songwriting and arrangements. The trio featured Ewan MacPherson (Shooglenifty) and Lauren MacColl (RANT) together with multi-award winning singer-songwriter Siobhan Miller. In 2016 Siobahn left the band to pursue her solo career and singer songwriter Jenny Sturgeon stepped in to replace her in the line-up. After seeing the band live in London recently, I think it was a wonderful and inspired choice and not an easy one, as Siobahn was an excellent musician and vocalist. But Jenny does far more than just replace Siobhan. She also brings something new and special into the mix with her own impressive songwriting skills, together with an great love of the natural world which shines brightly throughout. All these elements combine to provide 'Undersong' with it's high quality, instant warmth and universal appeal. The album was recorded in the restored Telford Church in Ruisgarry on the Outer Hebrides island of Berneray by the excellent producer Andy Bell, whose production credits include music by the cream of the folk, rock and pop world. The very impressive album opens with a celebration of the joys of walking. The lovely 'Old Shoes' written by Jenny also features the beauty of Lauren's fiddle playing and the richness of Ewan’s vocal harmonies. Jenny’s very infectious love for the wandering in the countryside shines through very clearly. Taken from 'Songs Of The North' by Harold Boulton and A C Macleod the hypnotic 'Turn To Me' is a tale of a baby stolen by a sea monster and replaced by a changeling whilst her mother gathered seaweed. With lyrics by John Wilson and music by Jenny, the song carries a sense of sorrow and loss, enhanced by a mournful viola melody and a heart beat percussive rythmn on the guitar. 'Lay Your Dark Low' takes it's name from of Salt House's debut album, With words and music by Ewan’s he plays some great finger picked acoustic guitar with vocals that remind me of Kris Drever from Lau. Combined with some perfectly matched harmonies from Jenny and fiddle playing from Laura, this is a wonderful piece of music with echoes of John Renbourn and Nick Drake. Adapted from an epic and dark Scandinavian tale of murder and vengeance collected by Robert Buchan, the traditional 'The Sister Revenge' finds two sisters preparing to avenge their father’s murder. The details of the foul deed and it's deadly outcome are revealed at the end. Ewan's new music perfectly suits the mood of the song. It has been almost 250 years since Robert Burns wrote the much-loved 'Now Westlin’ Winds', and it’s from that traditional classic that Jenny's draws her own tribute to love and nature 'Charmer'. With a harmonium drone and Lauren’s sensitive viola for backing, Jenny's gift for songwriting and poetry certainly shines through. On of the many standouts on the album is the wonderful 'Staring At Stars'. Jenny takes the lead vocal for Ewan’s song, A pure and enchanting vocal that dovetails perfectly with Ewan’s soft finger picked guitar accompaniment. The song then slowly builds adding Lauren’s fiddle and Ewan’s vocal harmonies. A beautiful piece of timeless music. Each of the members of Salt House each adds their own songwriting magic to this album. 'The Road Not Taken' sees Lauren adding new music and setting to Robert Frost's 1916 collection of poems 'Mountain Interval'. I love the arrangements and the layering of vocals over the strings and guitar melodies. Bowed mandola helps Ewan set a mediaeval feel for a sad and sorry Dorset/Somerset tale of love, pregnancy, deception and desertion on 'I Sowed Some Seeds' (Roud 914 The New Bachelor/The Hostess' Daughter). A tale of lost love is explored in 'Slow Fields Of Home' with beautiful fiddle and guitar interplay and its subtle shruti-box drone throughout. 'Undersong' is a high quality album from start to finish. With wonderfully layered arrangements and instrumentation added to Jenny's & Lauren pure and Ewan's rich vocals. It also showcases all the bands deep and exquisite musicianship and songwriting ability. 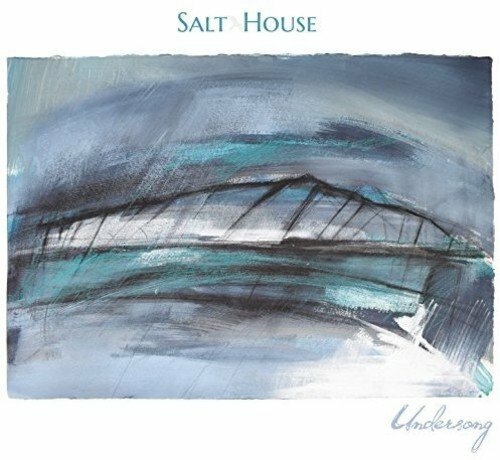 Salt House are a trio of exceptional talent and I hope that they will be one of the leading lights of Scottish Folk music for many years to come.